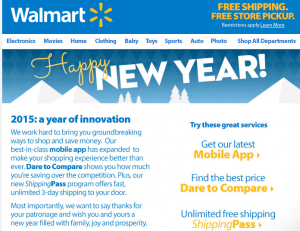 On New Year’s Day, I received this email from Walmart thanking me for my business and reminding me of the innovations they offered last year. When you remember that innovation is a creative solution to a customer’s problem, you gotta give Walmart props for innovation and brand consistency. The Walmart brand is all about low prices on lots of stuff. Last year’s innovations included a ShippingPass for unlimited free shipping, a ‘Dare to Compare’ feature to confirm their low prices, and an updated mobile app to tie it all together. Solving problems, one at a time. The ShippingPass solves a big problem. Thanks to Amazon Prime, nobody wants to pay for shipping. Now, we don’t have to. Dare to Compare lets you confirm that you are paying the lowest prices, and the mobile app lets you shop the way you want to – online anywhere, anytime. Truth is, Walmart has been innovating since the very beginning. 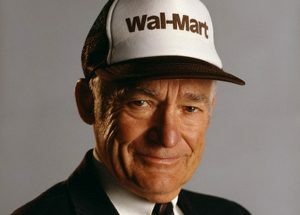 Sam Walton’s basic idea was to get concessions from his suppliers and pass the savings on to his customers. In the 1960’s that idea was unheard of. By contrast, Sears used to beat their suppliers down and keep the savings as profit. Sears is shrinking. Walmart is growing. And they have been marketing that innovation since the beginning. Walmart has consistently backed Sam’s philosophy with a brand campaign that assures the consumer: Low Prices. Always. While “low prices” is typically the space for commodities, Walmart has managed to monopolize the space while building and maintaining customer loyalty through innovation and change. It’s a win-win deal that will keep them in the lead, until somebody out-innovates them. PS. Last week Walmart announced it will be closing 154 U.S. stores, many of them Walmart Express locations in smaller towns. The express concept was not an innovation. It was an attempt to compete in a space that was already filled by Dollar General, local grocery stores, and big box drug chains. The 300 stores Walmart will open in the next two years will better fit the brand Sam created. good job skip. have a great session in miami. How can someone who has no skills or funds to build or market their product (all I have is a drawing) find help or a promoter to witness my drawings and see its potential. I could use some help. PLEASE!! !